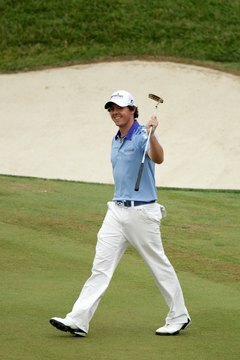 Rory McIlroy won the USGA's biggest event, the U.S. Open, in 2011. The Amateur Athletic Union and United States Golf Association are separate organizations that have much in common. They’re both venerable, nonprofit American organizations involved in athletics, and both involve golf. The main difference is that golf is only one of many AAU sports, while the USGA is involved with golf exclusively. The AAU was founded in 1888. As the name suggests, the organization is devoted to amateur sports and physical fitness programs As of 2012, the AAU sanctions competitions in 34 sports -- including golf -- and holds 250 national championships altogether, plus more than 30,000 age division events, according to the organization’s website. The AAU claims more than 500,000 participants and 50,000 volunteers. The AAU notes that it held more than 180 golf tournaments in 2011, in addition to numerous other events sanctioned by local and district AAU chapters. The organization’s premier series is the AAU World Junior Golf Tour, which holds sanctioned events worldwide for players age 6 through 18. The tour conducts 26 tournaments annually -- 20 in the United States and six abroad -- plus an invitation-only championship each May. Individuals must be AAU members to participate in AAU golf tournaments. AAU golf alumni include LPGA Tour pros Morgan Pressel, Lexi Thompson and Britney Lincicome, and PGA Tour pro Nicholas Thompson. The Amateur Golf Association of the United States was formed on Dec. 22, 1894. It was later renamed the United States Golf Association. In 1951, the USGA and the Royal & Ancient in Scotland teamed up to standardize golf’s rules, creating the uniform Rules of Golf. In the 21st century, the USGA’s primary functions include monitoring and updating the Rules of Golf and the game’s equipment standards. The organization created the the USGA Handicap System and continues to maintain the system of course ratings and individual handicaps. The USGA Green Section sponsors turfgrass and environmental research. Like the AAU, the USGA is a nonprofit organization. Unlike the AAU, the USGA’s chief tasks don’t involve running tournaments. Jurisdiction for the men’s and women’s elite golf tours in the United States falls on the Professional Golfers' Association of America and the Ladies Professional Golf Association. But the USGA does conduct three major professional tournaments: the U.S. Open, the U.S. Women’s Open and the U.S. Senior Open. The USGA is also responsible for 10 amateur championship tournaments. What Are the Subsidiaries of Callaway Golf?